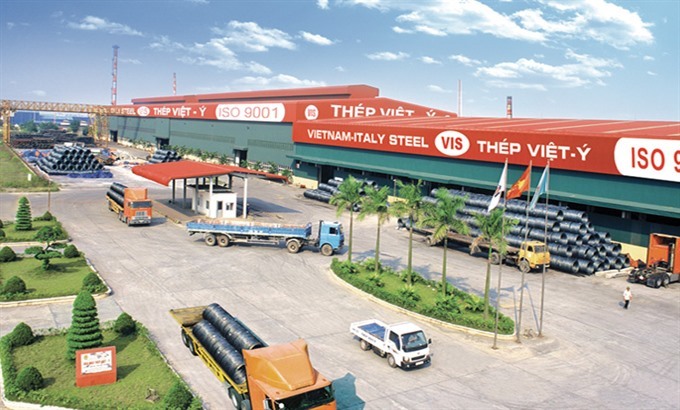 HÀ NỘI — Japanese Kyoei Steel Company has announced its registration to purchase 33.2 million additional shares or 45 per cent stake of Việt Nam-Italy Steel JSC (VIS). The registration was made after VIS received the approval to increase foreign ownership limit to 100 per cent. The registered stake is equal to the stake that Thái Hưng Trading JSC, which owns a 65 per cent stake in VIS, will divest. Currently, Kyoei owns 14.8 million shares of VIS, equivalent to 20 per cent stake of the company. If the transaction is successful, Kyoei will hold 65 per cent stake and become the parent company of VIS. The deal is scheduled to take place on the stock exchange from May 10 to June 6. VIS’ share is valued at VNĐ34,400 (US$1.51) per share, thus Kyoei may spend at least VNĐ1.14 trillion on the deal. VIS was established in 2001 by Sông Đà Corporation. The corporation later decided to divest all of its 26.1 million shares from VIS. The company specialises in producing and trading construction steel, import and export material, spare parts and equipment for the steel industry as well as logistics services.